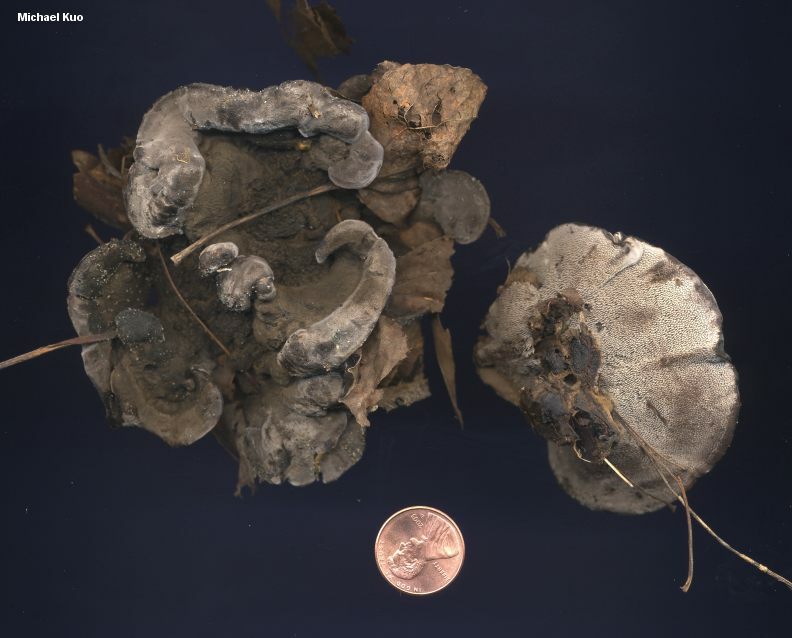 Here is an odd, spreading, toothed mushroom found in eastern North America under eastern white pine, eastern hemlock, and other conifers. It features a finely velvety, convex, gray cap with a whitish margin that often displays hints of blue. Its flesh, when sliced open, demonstrates a soft, whitish to grayish upper layer and a harder, black lower layer. Phellodon niger is very similar, and also features a lower layer of black flesh--but its cap usually becomes shallowly depressed (rather than convex), and its colors are darker. Ecology: Mycorrhizal with conifers (especially eastern white pine and eastern hemlock); sometimes reported under hardwoods; growing alone or gregariously; summer and fall; widely distributed in eastern North America. 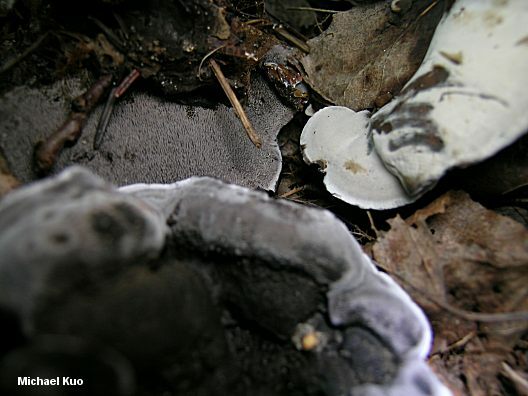 Cap: Single or fused with other caps; 3-9 cm wide; convex, becoming planoconvex or nearly flat; velvety; whitish to pale gray, becoming gray with a whitish to bluish margin. Undersurface: Running down the stem; covered with crowded spines that are 2-4 mm long; whitish at first, becoming gray. Stem: 4-6.5 cm long; 1-4 cm thick at apex; extremely variable in shape; smooth or finely velvety; colored like the cap. Flesh: Two-layered, with a whitish to pale grayish, spongy upper layer and a hard, black to bluish black lower layer. Odor and Taste: Odor mild or, more commonly, fragrant (reminiscent of curry or maple syrup), becoming stronger when dried; taste mild. Chemical Reactions: KOH on flesh bluish to greenish, then brown to black. 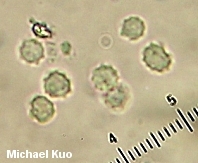 Microscopic Features: Spores 3.5-5 x 3-4.5 µ; globose to subglobose; echinulate with spines about .5 µ long. Clamp connections absent.